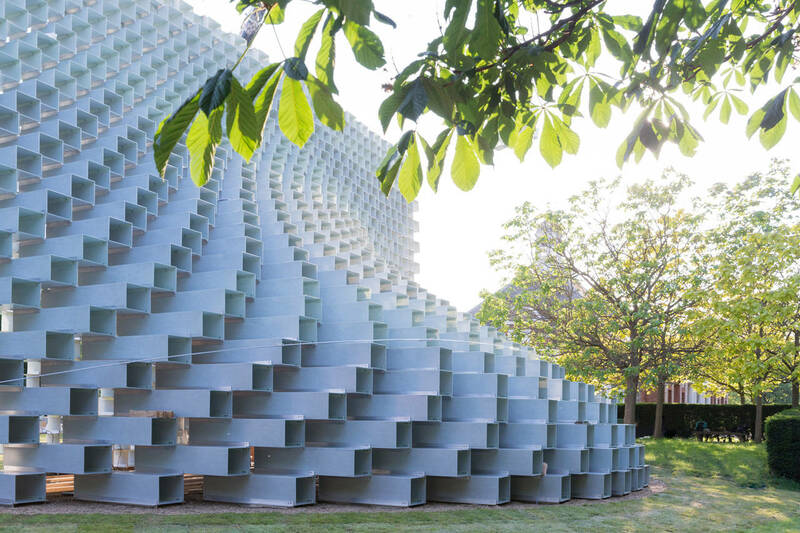 Since 2000, every year the Serpentine Gallery has commissioned a temporary summer pavilion to a significant international architect. Over the years great names have succeeded among them Zaha Hadid, Oscar Niemeyer, Jean Nouvel, Herzog & de Meuron, Sou Fujimoto. 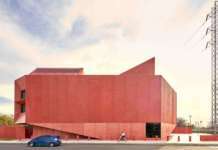 In 2016 the firm they chose Bjarke Ingels Group (BIG) (Copenaghen/New York). 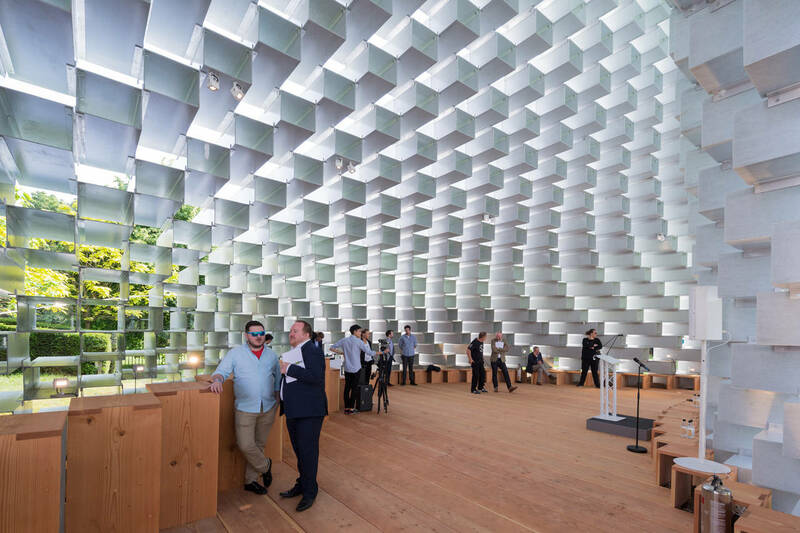 In addition, the pavilion will be joined by four Summer Houses designed by Kunlé Adeyemi – NLE (Amsterdam/Lagos), Barkow Leibinger (Berlin/New York), Yona Friedman (Paris) e Asif Khan (Lonon). 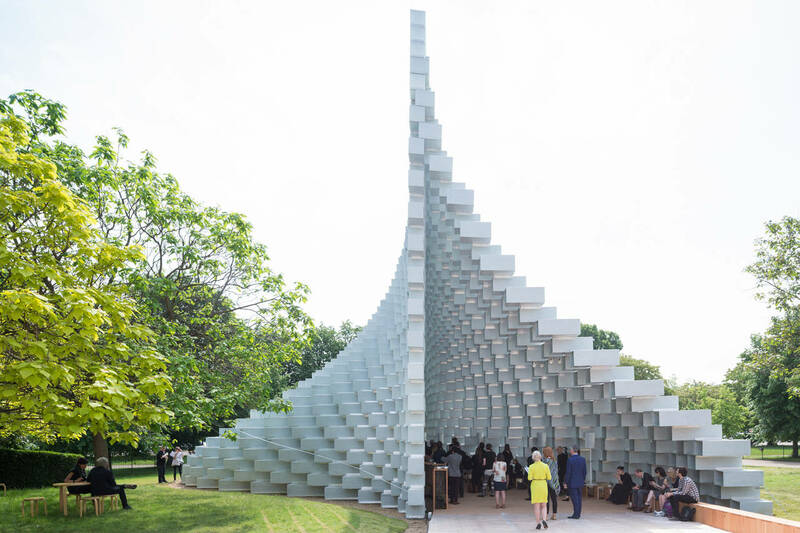 The Serpentine Pavilions are temporary structures, but they have always helped to trigger a debate on the future of contemporary architecture as well as being temporary spaces in which to organize artistic events. The context is that of the Kensington Gardens, a place where architecture meets nature and also an audience that every year interacts, always in a different way depending on the shape of the building, with a continuously surprising pavilion. 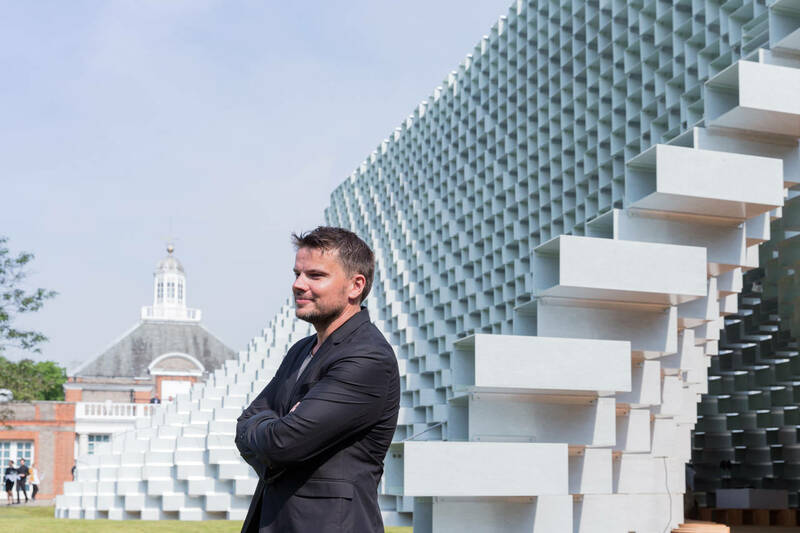 Bjarke Ingels and his team have decided to work on a architectural basic theme reinterpreting it in contemporary and above all temporary way. 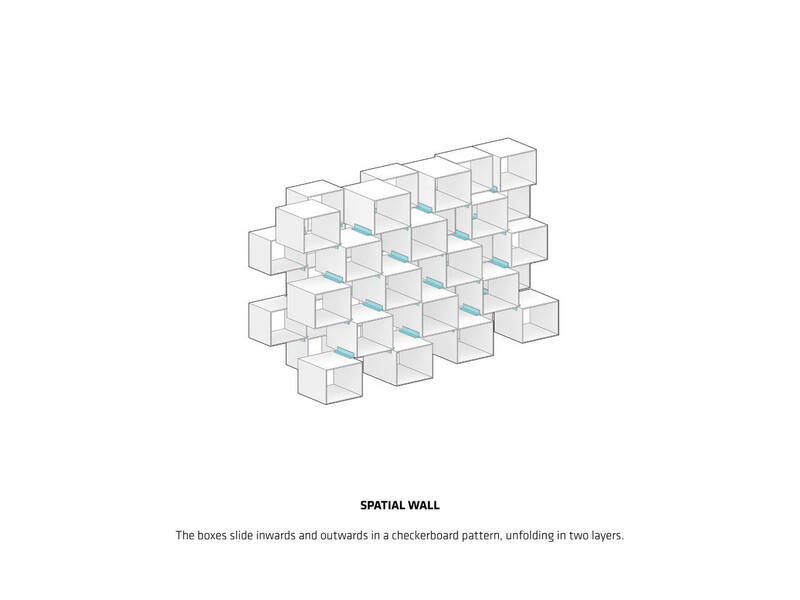 The brick wall is here proposed in a three-dimensional form: there is a module, that of the bricks, positioned so as to achieve a sculptural object, an exaltation of three-dimensionality. Even the material they used, just to maintain a temporary character, is much lighter then brick: fiberglass frames. During this summer, from June 2 to September 11, the concept of the wall will stop being surface to turn into space. 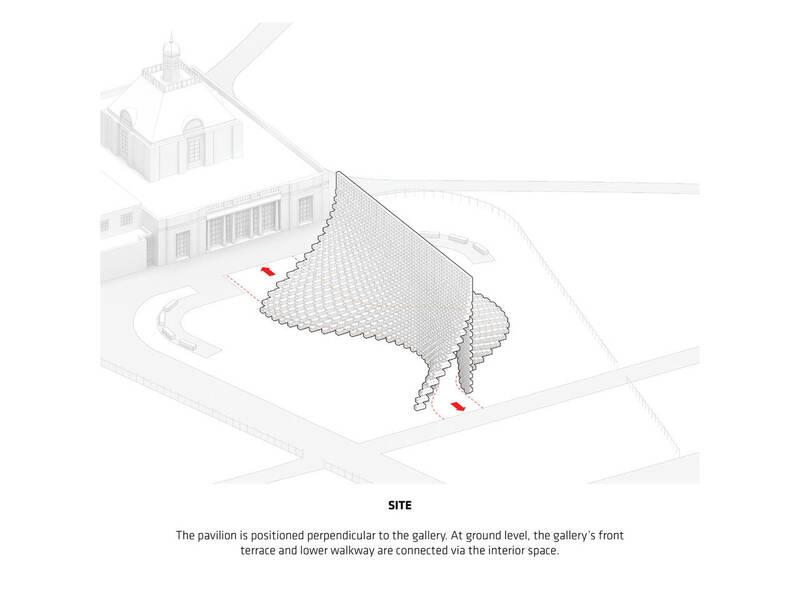 For the Serpentine Pavilion 2016, we have attempted to design a structure that embodies multiple aspects that are often perceived as opposites: a structure that is free-form yet rigorous, modular yet sculptural, both transparent and opaque, both box and blob. 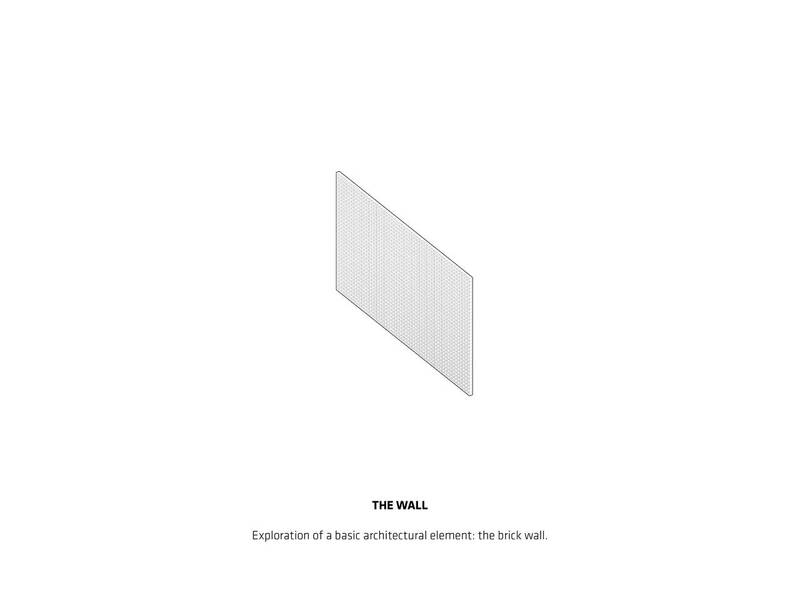 We decided to work with one of the most basic elements of architecture: the brick wall. 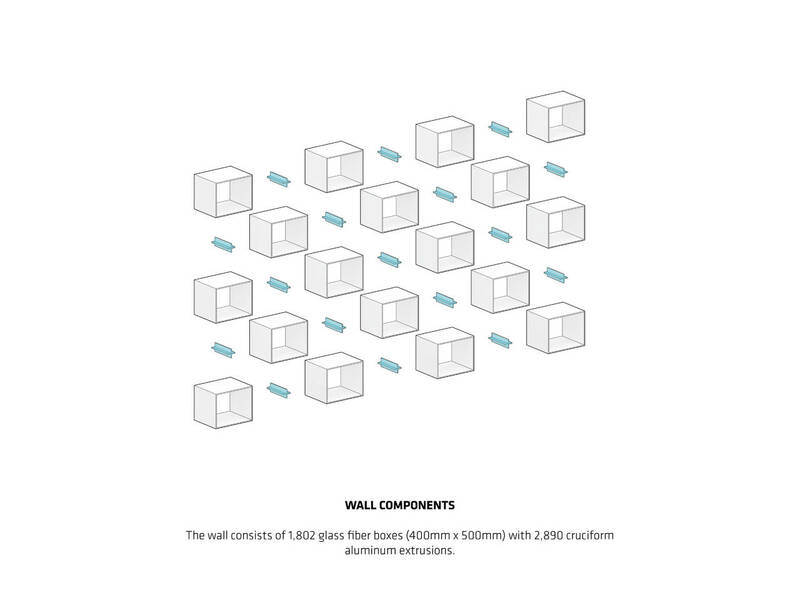 Rather than clay bricks or stone blocks – the wall is erected from extruded fiberglass frames stacked on top of each other. 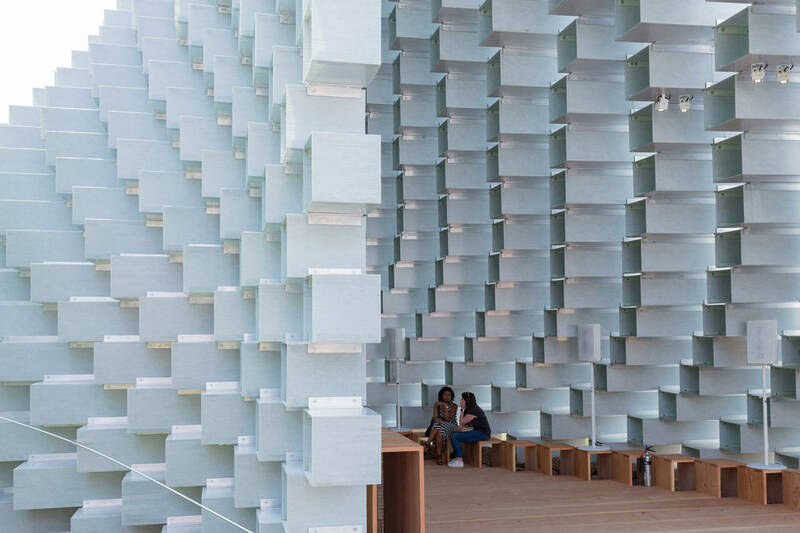 The wall is pulled apart to form a cavity within it, to house the events of the Pavilion’s programme. 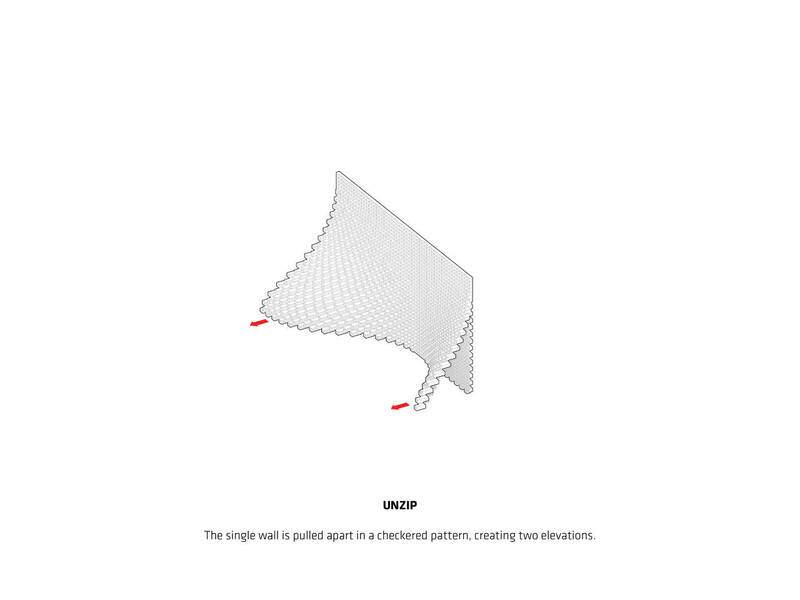 The unzipping of the wall turns the line into a surface, transforming the wall into a space. A complex three-dimensional environment is created that can be explored and experienced in a variety of ways: inside and outside. 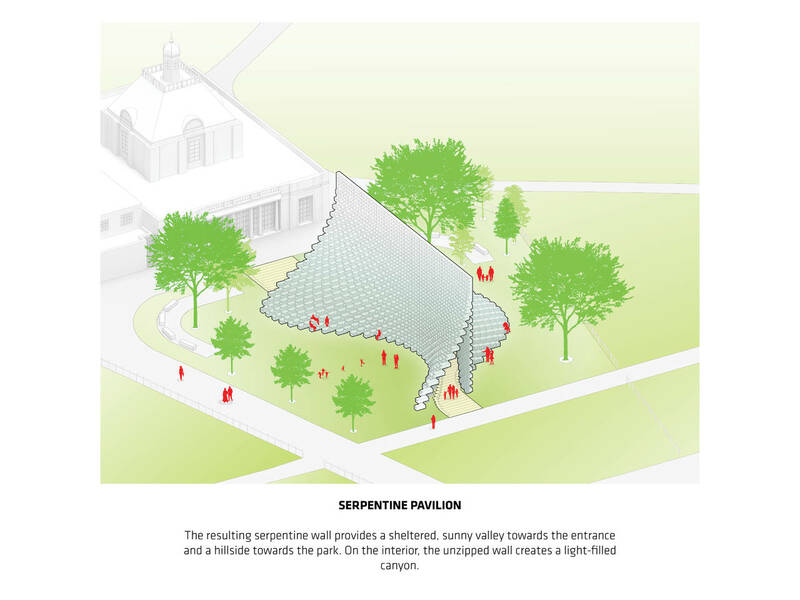 At the top, the wall appears like a straight line, while the bottom of it forms a sheltered valley at the entrance of the Pavilion and an undulating hillside towards the park. The unzipped wall creates a cave-like canyon lit through the fiberglass frames and the gaps between the shifted boxes as well as through the translucent resin of the fiberglass. 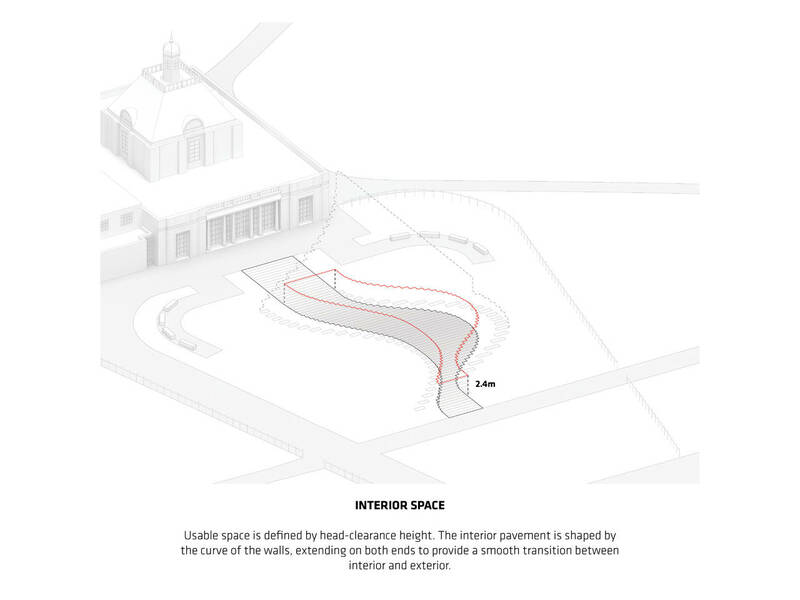 As a result, the shifting overlaps as well as the movement and presence of people outside create a lively play of light and shadow on the cave walls within. The materials include wooden floors and extruded Lay Light by Fiberline profiles, providing every surface with a warm glow and linear texture – from the mesh of woven glass fibers to the undulating lines of the grain of the wood. This simple manipulation of the archetypical space-defining garden wall creates a presence in the Park that changes as you move around it and through it. 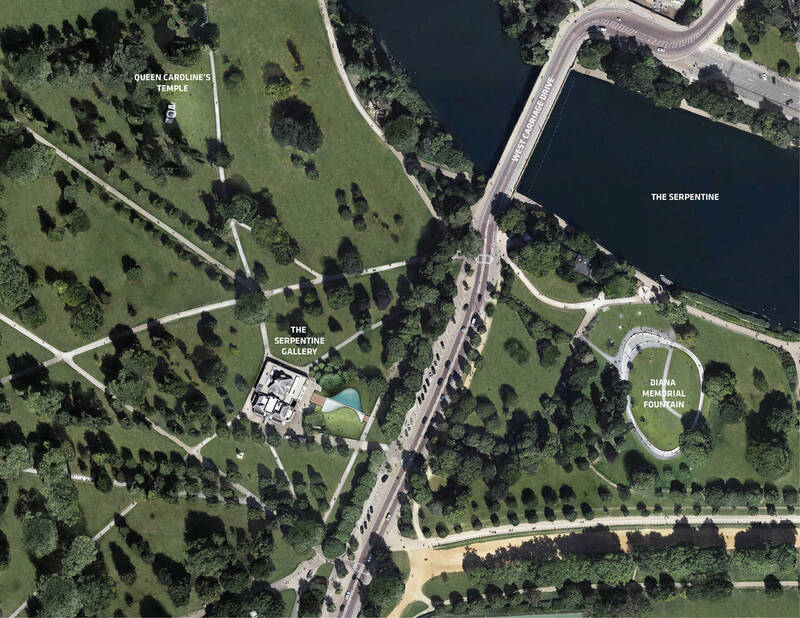 The North-South elevation of the Pavilion is a perfect rectangle. 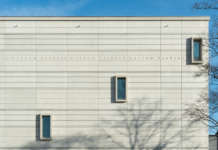 The East-West elevation is an undulating sculptural silhouette. 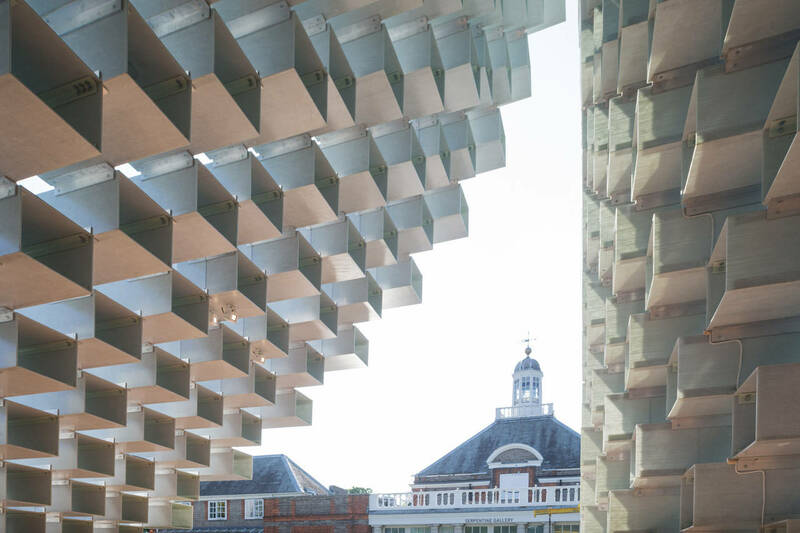 Towards the East-West, the Pavilion is completely opaque and material. Towards the North-South, it is entirely transparent and practically immaterial. 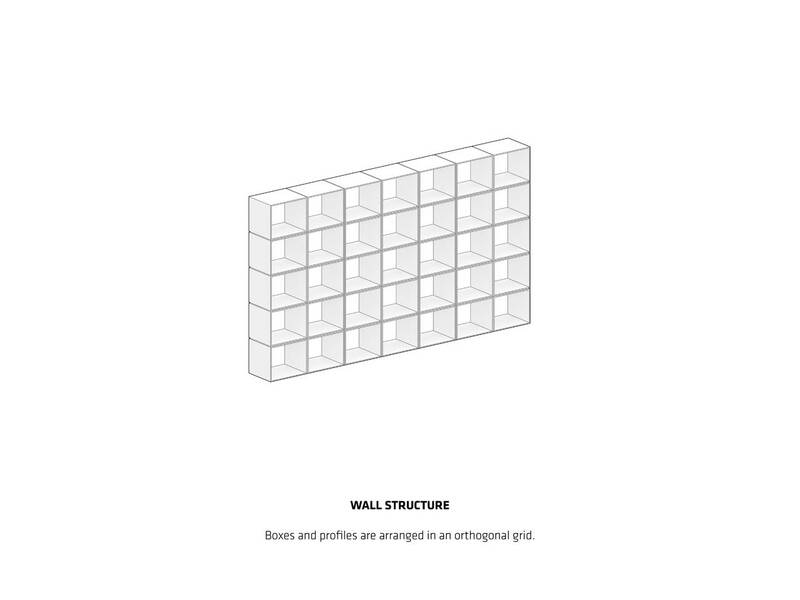 As a result, presence becomes absence, orthogonal becomes curvilinear, structure becomes gesture and box becomes blob."